What a ridiculous title for a post, eh? “Grab the handle and pour”, is the expected response. However, as anyone who’s tried to use a yixing pot for the first time can probably tell you, there’s a little more to it than that. First of all, let’s clarify that I’m mostly talking about fairly small teapots, in the smaller-than-400ml range. Those big heavy twenty-cup teapots are pretty foolproof and you don’t need an article on this blog to tell you how to use them! Often, teapots of this size are called Yixing (宜兴, pronounced roughly “ee-shing”), even if they are not from the Yixìng region of Jiāngsū province which is most famous for the style. Debating the authenticity, usefulness, and naming of these pots is far beyond the topic of this post, but suffice to say if you have a small teapot made of clay, ceramic, glass, or even silver, these principles will apply. Before anything else, warm the teapot with some hot water before using it (then pour it out). While this may seem like a chore if you’re really looking to dig into that first cup of tea, you can turn it into a pleasurable experience all by itself. First, some clay pots will make delightful bubbling sounds when they start to absorb water, and hearing that symphony is a great prelude to get my senses focused on the task at hand. Second, the tea will likely turn out better, since the water temperature can drop significantly when pouring into a cold pot. But third, and the most fun in my opinion, is that a warm pot can produce an amazing fragrance from tea leaves. As soon as you are done warming the pot, toss in your dry tea leaf and shut the lid. Give the leaves just a few moments to heat and then carefully (lest you burn your nose hairs) lift the lid and inhale the aroma. A good quality tea will produce a fragrance to stop time. You can also sniff the inside of the lid which will protect your nose from the hot steam. Once the tea has infused for an appropriate amount of time (which can vary considerably based on preference), it’s best to pour it all out. If making tea for more than one cup, either pour the infusion into a sharing pitcher or fill each cup about half-way once before returning and filling each cup the remainder. In this way the strength of the infusion is more-or-less constant between cups. Having a pitcher requires much less practice than knowing how full each cup should be and avoiding drips on the table. As the teapot is being poured, the angle will increase from horizontal to vertical (and sometimes beyond) which can cause the most disastrous and unfortunately common type of broken teaware that I’ve seen: the lid will fall off, sometimes even cracking the cup as it lands. I think everyone who’s owned a small pot has gone through this experience or has seen someone who has. There’s no shame to not remembering to hold the lid, but there’s a few different ways to go about it. Probably the most simple is to use two hands, placing one hand on the lid and using the other to grasp the teapot handle. The second method is to use a free finger on the pouring hand to hold the lid in place; this technique can be done with either the index finger (more traditional) or the thumb, depending on the size of your hand and your grip on the teapot. It’s best to avoid touching the lid itself which is likely to be extremely hot, but every teapot should have a knob or handle with which it can be held safely. The trick with any method is to avoid covering the small hole in the lid which prevents a vacuum from forming inside the teapot that would stop or slow the pour. (In fact, a well-made lid will fit on the teapot so well that covering the hole should stop the pour of liquid completely.) If using the one-handed technique, this is generally accomplished by putting a little bit of sideways pressure on the lid’s knob rather than covering it completely. Even though I’d say that a Gaiwan is worth ten teapots for its flexibility and convenience, there’s a definite aesthetic about a Yixing or Jianshui teapot that can really be pleasant to use. And with practice and an appropriate pot it’s possible to create infusions that bring out hidden characteristics of the best and least of the tea world. Not every pot will work well for every tea, so if you have a pot, give it a try with different leaves and different times to find what suits it (and your taste) best. Just remember to keep the lid on top! 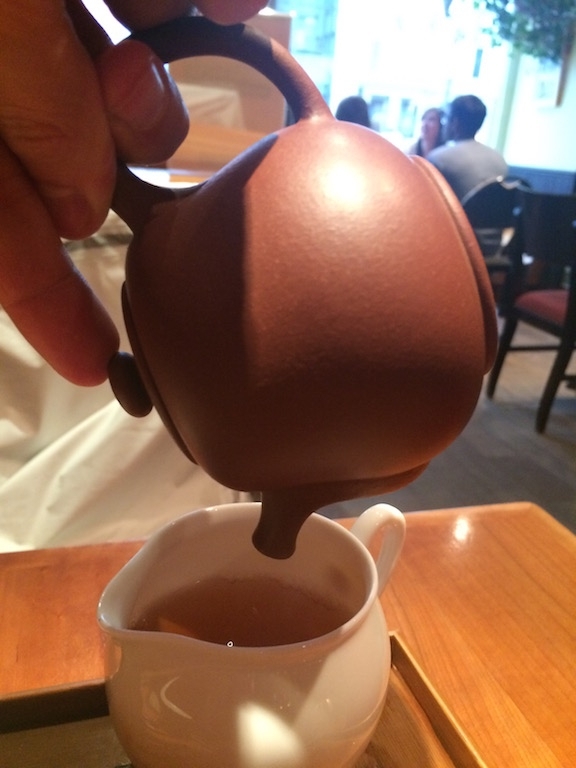 This entry was posted in Teaware and tagged tea preparation, teapots, yixing on May 19, 2015 by payton.